The North Atwater pedestrian bridge that broke ground on Monday is part of the city of LA’s new multimodal approach. It’s meant to provide an easy connection between the shops and cafes on Glendale Boulevard in Atwater Village and the trails and green space of Griffith Park -- for all modes of transportation except cars. Equestrians have been asking for this bridge for years. Otherwise they have to cross the river by riding their horses through it, and the algae-covered banks can be quite slippery. 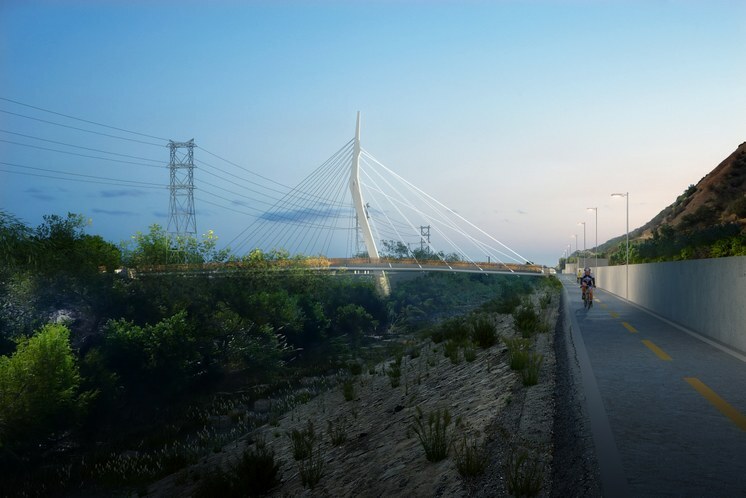 This bridge is just the first of three bike and pedestrian bridges planned for the LA River. There will be others in Glendale and Frogtown. And it’s part of a larger goal of revitalizing the LA River and making it a recreation destination rather than something to be crossed over as quickly as possible. It’s the first cable-stayed bridge in LA, with a 325-foot span, and has a bit of a sailboat-like design. “It's going to have a tall mast pole in the middle of the river. And from that tall pole will be cables that come out and kind of swoop to either side to structurally support the bridge. So it will be a powerful visual marker on the river,” said Deborah Weintraub, the chief deputy city engineer for the City of Los Angeles. There will be two separate decks, one for horses and the other for pedestrian and bike traffic. That’s so the horses don’t get spooked by bikes zooming past. The bridge is set to be completed by late 2019. Early engineering and design work was done by Buro Happold, and the non-profit group River LA shepherded the project and raised funds for it. Plans for this bridge began in 1998 when then-District 4 Councilman John Ferraro filed a motion to build it, because equestrians were crossing the LA River at great risk and it exposed the city to liability. A funding source arrived in 2010 when landscape designer Mia Lehrer connected developer and philanthropist Morton La Kretz with River LA. La Kretz wanted to help the city realize one of the projects in the 2007 LA River Revitalization Master Plan. When the City Council and the Bureau of Engineering approved the North Atwater Bridge in 2013, it was supposed to cost $6 million, and La Kretz was going to pay for all of it. Meanwhile construction, material and labor costs went up as the economy improved. The price tag is now $16 million. Three-quarters of that cost will now be shouldered by taxpayers in the form of state and city funding. A rendering of the North Atwater pedestrian bridge, courtesy of River LA.